Singh and Patel came to the United States six months ago after being the top finishers in an Indian reality TV show called the "Million Dollar Arm" that drew about 30,000 contestants. The show sought to find athletes who could throw strikes at 85 miles per hour or faster. While neither pitcher threw hard enough to earn the $1 million prize, Singh made $100,000 from the contest and Patel made $2,500, plus his trip to the United States. The contest was sponsored by a California sports management company that believed it could locate major league-worthy arms in a country of more than 1 billion. After working extensively with Southern California pitching coach Tom House since May, the pitchers staged a tryout in Tempe, Ariz., on Nov. 6 that was attended by 30 major league scouts. "The Pirates are committed to creatively adding talent to our organization," Pirates general manager Neal Huntington said Monday. "By adding these two young men, the Pirates are pleased to not only add two prospects to our system but also hope to open a pathway to an untapped market. We are intrigued by Patel's arm strength and Singh's frame and potential." Neither pitcher has taken the mound in a game situation, no doubt a first for a Pirates prospect. They have pitched in scrimmages against junior college competition. Both threw the javelin in India, a country best known for producing cricket players, and neither the right-hander Patel nor the left-hander Singh had left his small village before coming to the United States. Singh was born in Bhadoni, Uttar Pradesh, and is the youngest of nine children. Patel is from Varanasi, Uttar Pradesh, and has four brothers and sisters. 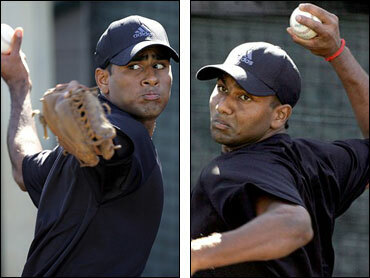 The 5-foot-11, 185-pound Patel hit 90 mph on the radar gun during his tryout, and the 6-2, 195-pound Singh topped out at 84 mph. Each has thrown harder during workout sessions that weren't attended by scouts. "Think of them as two Dominican kids," House told the scouts. "They're very raw. But I think this has a huge upside." When they first came to the United States and began playing catch, the pitchers were mystified by the concept of gloves and had to taught not to try to catch the ball with their bare hands. Despite being more than raw, the pitchers were signed by well-known agent Jeff Borris, who was attracted by their potential after watching them work out at Southern Cal. Borris estimates they will need three to four years of minor league experience before becoming major league ready. Patel and Singh are learning English, most of which they have picked up from watching ESPN's Baseball Tonight and by taking online classes. "These young men have improved a tremendous amount in their six-month exposure to baseball and we look forward to helping them continue to fulfill their promise," Huntington said. The signings represent a shift in policy for the Pirates, who have mostly ignored nontraditional markets such as Asia for players.